PACAMARA COFFEE – Pacamara is a hybrid between Pacas (a Typica mutation – Coffea arabica var. pacas) and Maragojipe (Coffea arabica var. maragojipe). First bred in 1958 in El Salvador, Pacamara is thought to have been developed in order to create a variety of Typica with larger coffee beans. PACAS COFFEE – A Coffea arabica coffee plant varietal (Coffea arabica var. pacas) that is a natural mutation of Coffea arabica var. bourbon. Pacas was discovered in 1949 in El Salvador. Also see Caturra Coffee. PACHE COLIS COFFEE – A Coffea arabica coffee plant varietal (Coffea arabica hybrid pache colis) that is distinguished by its large coffee fruits (cherry), rough-textured leaves, and secondary as well as tertiary branching. Pache colis was first discovered on a farm in Mataquescuintla, Guatemala where Pache comum and Caturra coffee plants were growing. Thus Pache colis is considered an Arabica hybrid between those two varietals. Pache colis also has the desirable quality of being somewhat resistant to the coffee disease called phoma, which is a genus of soil fungi. PACHE COMUM COFFEE – A Coffea arabica coffee plant varietal (Coffea arabica var. pache comum) that is a mutation of the Typica varietal (Coffea arabica var. typica) and produces a brewed coffee known to be smooth and perhaps somewhat flat. Pache comum was first discovered on a coffee farm called El Brito, Santa Cruz Noranjo in Santa Rosa, Guatemala and grows best at elevations between 3,500 feet and 5,300 feet above sea level. PACK – Coffee grinds tamped in a filter basket in a portafilter of an espresso machine (espresso maker) previous to the brewing of the espresso shot(s). Also see Puck; Tamping Espresso Coffee. PACKAGING – See Coffee Packaging. PANAMA COFFEE (Panamanian Coffee) – See Panama Coffee. PANAMA GEISHA (Panama Gesha; Panamanian Geisha; Panamanian Gesha) – See Panama Geisha Coffee. PAPERY – A brewed coffee taste resulting from poor quality filter paper, or from coffee packaged in paper bags. This papery quality may also be present in some instant coffees due to particular types of instant coffee processing. PAPUA NEW GUINEA ARONA COFFEE (New Guinea Arona Coffee) – See New Guinea Arona Coffee. PAPUA NEW GUINEA ARUSHA COFFEE (New Guinea Arusha Coffee) – Papua New Guinea Arusha is a market name for the Arusha varietal grown in Papua New Guinea. An Arabica coffee plant varietal that is either a Typica or French Mission variety. Also see Papua New Guinea Coffee. PAPUA NEW GUINEA COFFEE (New Guinea Coffee) – See Papua New Guinea Coffee. PAPUA NEW GUINEA KIMEL COFFEE (New Guinea Kimel Coffee) – See New Guinea Kimel Coffee. PAPUA NEW GUINEA SIGRI COFFEE (New Guinea Sigri Coffee) – See New Guinea Sigri Coffee. PARCHE – French term for the thin, stiff, white, papery (parchment-like), skin (membrane) which forms a protective layer around the inner seed (pit; coffee bean) of a wet processed (washed) coffee cherry (fruit). Parche is also called parchment (English), pergamino (Spanish), and pergaminho (Portuguese). Parche is typically left on the dried green coffee beans after the outer skin and pulp are removed and when the coffee beans are stored before roasting because it helps to protect the beans until they are roasted. The parche then crumbles off naturally as chaff during the coffee roasting process. The word parche also refers to the coffee beans in general when they are at this stage of the coffee’s processing, thus coffee may be shipped en parche, or in parchment (English), en Pergamino (Spanish), or em pergaminho (Portuguese). Milling may be used to remove the parchment before roasting. PARCHMENT – The thin and stiff, papery (parchment-like), white skin (membrane) that forms a protective layer around the inner seed (coffee bean) of a wet processed (washed) coffee fruit (coffee cherry). Parchment is also called parche (French), pergamino (Spanish), and pergaminho (Portuguese). Parchment is often left on the dried green coffee beans after the outer skin and pulp are removed and when the beans are stored before roasting because it helps to protect the coffee beans until they are roasted. The parchment then crumbles off naturally as chaff during the roasting process. The word parchment also refers to the coffee beans in general when they are at this stage of the coffee’s processing. Coffee may be shipped in parchment, or en pergamino (Spanish), em pergaminho (Portuguese), or en parche (French). Milling may be used to remove the parchment before roasting. PARE COFFEE – Grown in southern Tanzania, Pare coffee is also known as Mbeya – both are market names for coffees from this southern region. Also see Tanzania Coffee. PAST CROP – A taste taint that is created during the aging process by enzyme changes in the coffee beans, providing a slightly less acidy flavor. PANCOER COFFEE ESTATE (Pancur Coffee Estate) – One of the five largest Dutch colonial estates on the eastern end of the island of Java in Indonesia. The finest Java coffee comes from these large plantation estates established by the Dutch government in the 18th century when Java was part of the Dutch East Indies. Together these large estates – Kayumas, Tugosari, Blawan, Pancoer, and Jampit – encompass more than 4,000 hectares of coffee tree plantings. PAPUA NEW GUINEA BLUE MOUNTAIN COFFEE – The Blue Mountain coffee plant varietal (Coffea arabica var. blue mountain), when grown in the proper conditions and also harvested and processed properly, produces a full-bodied, sophisticated coffee. Traditionally grown in the Blue Mountain District of Jamaica, the coffee is known to be silky smooth and well-balanced, with a full body, classic mild taste, and slightly sweet, rich flavor. A good Blue Mountain coffee, despite how smooth it tastes, exhibits a bright, even vibrant acidity, virtually no bitterness, and a sparkling aroma with sweet herbal and nutty overtones. Also see Jamaica Blue Mountain Coffee. PB Coffee Beans – See Kenya PB Coffee Beans. PEABERRY COFFEE BEAN (Peaberry Coffee) – See Peaberry Coffee Beans. PEABERRY KONA COFFEE (Peaberry Hawaiian Kona Coffee) – See Kona Peaberry Coffee. PEASY – An unpleasant coffee taste taint reminiscent of very fresh green peas. 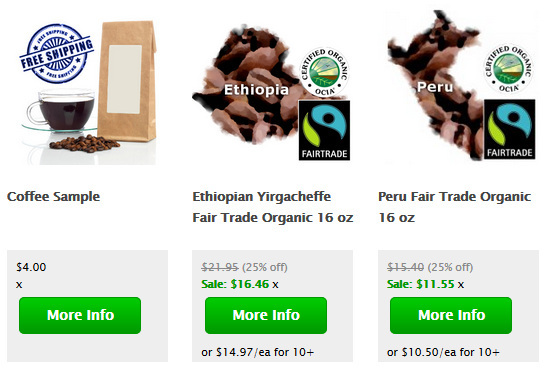 PEET’S COFFEE & TEA – See Coffee Companies. PENNY UNIVERSITIES – A term for 17th century London coffeehouses (the first opened in 1637) which charged one penny for entry. As coffeehouses proliferated throughout Great Britain including near universities, they were frequented by many students and thus came to be know as “Penny Universities” because the locals would say that for the cost of a cup of coffee (a penny), a student could learn more than from all of their books. The coffeehouses were also sometimes called “Seminaries of Sedition” because they offered visitors the opportunity to discuss politics and debate current issues. Also see World’s Best History of Coffee. PERCEIVED VALUE – How a typical restaurant patron evaluates a cup of coffee by considering its taste, strength, presentation, and price while also comparing the amount paid for the cup of coffee to the pleasure received from consuming it. PERGAMINHO – Portuguese term for the thin, stiff, white, papery (parchment-like), skin (membrane) which forms a protective layer around the inner seed (pit; coffee bean) of a wet processed (washed) coffee cherry (fruit). Pergaminho is also called parchment (English), pergamino (Spanish), and parche (French). Pergaminho is typically left on the dried green coffee beans after the outer skin and pulp are removed and when the coffee beans are stored before roasting because it helps to protect the coffee beans until they are roasted. The pergaminho then crumbles off naturally as chaff during the coffee roasting process. The word pergaminho also refers to coffee beans in general at this stage of processing. Thus coffee may be shipped en pergaminho (Portuguese) in parchment (English), en pergamino (Spanish), or en parche (French). Milling may be used to remove the pergaminho before roasting. PERGAMINO – Spanish term for the thin, stiff, white, papery (parchment-like), skin (membrane) which forms a protective layer around the inner seed (pit; coffee bean) of a wet processed (washed) coffee fruit (cherry). Pergamino is also called parchment (English), pergaminho (Portuguese), and parche (French). Pergamino is usually left on the dried green coffee beans after the outer skin and pulp are removed and when the coffee beans are stored before roasting because it helps to protect the beans until they are roasted. The pergamino then crumbles off naturally as chaff during the coffee roasting process. The word pergamino also refers to the coffee beans in general when they are at this stage of the coffee’s processing, thus coffee may be shipped en pergamino, or in parchment (English), en parche (French) or em pergaminho (Portuguese). The parchment may be removed before roasting in the process of milling. PERU CHANCHAMAYO HIGH GROWN COFFEE (Peru Chanchamayo High Grown Coffee; Peru Chanchamayo High-Grown Coffee) – See Peru Chanchamayo High Grown Coffee; Peru Coffee. PERU COFFEE (Peruvian Coffee) – See Peru Coffee. PERU URUBAMBA COFFEE (Peru Urubamba Coffee) – See Peru Urubamba Coffee; Peru Coffee. PHENOLIC COMPOUNDS (Phenolic Acids) – In brewed coffee, a relatively high ratio of phenolic compounds may cause a creosol taste – a supplemental coffee flavor sensation that exhibits a mostly scratching sensation at the posterior (back) of the tongue. This is created in part by giving coffee beans a Dark Roast. PHOMA – A genus of common soil fungi that may affect (afflict) coffee plants. Some coffee plant varietals and hybrids, such as the hybrid Pache Colis, show some degree of resistance to the phoma coffee disease. PILE DRIVER (Pile-Driver) – See Espresso Drink Recipes. PIONEER STEAM COFFEE AND SPICE MILLS – Original name of the company run by James Folgers and partners until Folgers bought out his partners in 1872 and renamed it J.A. Folger & Company. Folgers died in 1889 and the company was run by his son James A. Folger II. As the company continued to grow rapidly, their main product was bulk-roasted coffee sold to grocery stores in sacks and drums. The coffee was scooped out and sold to the consumer. The Procter & Gamble Company (P&G) purchased Folgers Coffee Company in 1963 and began distributing the product nationally under the Folger name. The J.M. Smucker Company completed a merger with The Folgers Coffee Company (a Procter & Gamble Company subsidiary) in 2008. Folgers uses their registered Mountain Grown® label on their coffee. PIPE – An external tube on an espresso machine (espresso coffee maker) which provides live steam used for steaming milk, heating it and also aerating the milk to create a frothy, creamy steamed milk as well as foam for use in an espresso-based specialty coffee drink (espresso drink). The pipe on some espresso machines is also used to dispense hot water and to heat the cup (e.g., demitasse) for an espresso shot. The pipe may also be used to heat water. The pipe is controlled by the steam knob which opens and closes the espresso machine’s steam valve. The pipe is also called the stylus, nozzle, and steaming wand. Also see Steaming and Frothing Milk; Foam. PIPELINE PORTER – A type of beer brewed using Kona coffee. Pipeline Porter is known for its roasty aroma and earthy complexity. Also see Hawaii Coffee; Hawaii Kona Coffee. PIQUANT – A secondary coffee flavor characteristic/taste sensation which produces a mostly sweet sensation (perhaps prickling) on the tongue tip. The piquant sensation is created by an abnormally high percentage of acids that actually create a sweet rather than sour taste. Kenya AA coffee is known to exhibit this piquant quality. PISTON – The part of an espresso machine (espresso maker) in which water is forced at high pressure through a bed of tamped (compacted) roasted and finely ground coffee. Typically either a lever or spring is utilized to apply the pressure in the piston. See Spring Piston Espresso Machines; Lever Espresso Machines. PISTON-DRIVEN ESPRESSO MACHINES (Piston Driven Espresso Machines; Piston Machines; Piston Espresso Machines) – See Piston-Driven Espresso Machines. PLUMA – See Mexican Oaxaca Pluma Coffee. PLUMBED IN (Plumbed-In) – Refers to an espresso machine (espresso maker) that is attached directly to a water line in the building and thus delivers water upon demand without the need to refill the machine or otherwise provide another water source. This plumbed-in feature is standard on commercial espresso machines and is also a feature on some smaller prosumer espresso machines. If an alternative water supply is used then you will need to also provide approximately 50 to 75 pounds per square inch of water pressure typical of standard plumbing. This can be done with a helper pump. PLUNGER POT – A coffee brewing method and also the name of the piece of coffee equipment (a coffee maker) that allows coffee grinds to soak directly in hot water. The spent grounds are then separated from the brewed coffee by pushing a mesh plunger to the bottom of the coffee pot. The Plunger Pot, or French Press is widely considered as the best method for brewing premium gourmet coffee and enjoying all of its best qualities (e.g., body, aroma, acidity, aftertaste, bitterness, sweetness). A typical Plunger Pot coffee maker is a cylindrical glass container with a round, metal screen filter/plunger which is tightly fitted to the cylinder. To brew the coffee, first remove the mesh plunger from the Plunger Pot and place the ground coffee in the bottom of the glass container. Generally a course grind size is used in the Plunger Pot method. Next add the hot water and give it a slight stir or insert the mesh plunger just a bit so as to moisten the top surface of the coffee grounds. The Plunger Pot method doesn’t filter the coffee through a paper filter so the coffee’s volatile oils are not removed, helping to retain the coffee’s natural body. The Plunger Pot method is also the best brewing method for controlling the coffee’s temperature and brewing time. Depending on how strong you like your coffee, the brew will be done in two to six minutes, at which time you can push down the mesh plunger to force water through the screen mesh and separate the extracted coffee grounds from the extracted coffee beverage. The Plunger Pot is also called Bodum, Cafetiere, or French Press. POD COFFEE (Pad Coffee) – See Coffee Pods. PODS – See Coffee Pods. POD COFFEE MAKERS (Pod Coffee Brewing Machines; Pod Coffee Machines) – See Pod Coffee Makers. POD ESPRESSO MACHINES (Pod Espresso Brewing Machines; Pod Espresso-Brewing Machines; Pod Espresso Makers) – See Pod Espresso Machines. POD COFFEE BREWING MACHINES (Pod Brewers; Pod Machines) – See Pod Coffee Makers; Coffee Pods. POD COFFEE MAKERS (Pods Coffee Makers; Pod Coffee Maker; Pod Coffee Machines; Coffee Pod Machines; Coffee Pods Machines; Pods Coffee Machine; Pods Coffee Machines) – See Pod Coffee Makers; Coffee Pods. POD PORTAFILTER – An espresso machine portafilter that is specifically designed to hold espresso pods and not just loose ground coffee. Pod portafilters may be designed in accordance with the Easy Serving Espresso Pod (ESE) specifications. Today many espresso machines, including espresso machine brands other than Illy, accommodate the use of either a 45 mm, 7 gram pod or hand tamped coffee grounds. See Espresso Machines; Espresso Brewing. POINT – Denotes a coffee which exhibits good body, acidity, and overall flavor, generally displaying all good characteristics. POOP COFFEE – See Civet Coffee. POOR – Denotes a brewed coffee exhibiting only a common taste. PORTAFILTER – The part of an espresso machine (espresso maker) that holds the filter basket(s) which in turn hold the roasted, finely ground coffee during the brewing of espresso. The portafilter, which is also called the groupo or filter holder, contains either one or two spouts (usually two), out of which the espresso pours. A typical portafilter also has a handle that is made out of wood, plastic, or another material, and which will not heat up easily when the espresso machine heats up. Most portafilters look like a small cup on the end of a handle – this cup holds the ground coffee which is used to brew one or two shots of espresso. Most portafilters have two spouts so two espresso shots may be brewed simultaneously. The design of the portafilter is such that it is very easy and relatively quick to attach (e.g., clamp) and detach (e.g., unclamp) the portafilter from the group on the espresso machine. Portafilters may be constructed from chrome-coated brass or copper (on more expensive models) or steel, aluminum, or other heat-tolerant materials. PORTAFILTER SNEEZE – The sudden release of pressure when the portafilter of an espresso machine is removed too soon after brewing a shot of espresso. This pressure release may happen on piston-driven espresso machines or pump-driven espresso machines which do not have a pressure relief system, and thus may require 30 seconds to one minute, or longer before the pressure (e.g., 135 pounds per square inch) bleeds off and it is safe to remove the portafilter. The instant release of pressure from the brewhead of the espresso machine during a portafilter sneeze can potentially cause injury due to the spraying and splattering of extremely hot, wet coffee grinds and steamy water. POSITIONING – Creating an image of a business/operation for a particular target market using a careful planning strategy that takes into account the quality of the roasted coffee, the price, the serving quality, and all other aspects of the business. POSITIVELY COFFEE – See Coffee Associations, Organizations, and Boards. POTATO – An undesirable coffee taste taint reminiscent of raw potato. PREINFUSION (Pre Infusion; Pre-Infusion; Pump Preinfusion; Pump Pre-Infusion; Pump Pre Infusion) – The process of pre-wetting the bed of roasted, ground, tamped coffee within the filter basket and portafilter of an espresso machine before beginning the actual espresso brewing process. Pre Infusion, which is a feature on some Automatic Espresso Machines and super automatic espresso machines, is typically accomplished by the espresso machine’s pump to send water onto the bed of tamped coffee for one to two seconds, followed by a brief pause, after which the pump again activates and completes the brewing of the espresso shot(s). Also see Progressive Preinfusion. PREMIUM BLEND – A high-quality gourmet coffee blend often used by fine restaurants to complement the high quality of their food and overall meal presentation. PREMIUM COFFEE – The terms premium coffee, premium gourmet coffee, and specialty coffee all refer to the top quality coffee beans of the world, grown and processed with care with the goal of developing and preserving the coffee beans’ best flavors and aromatic qualities. Some of the world’s top premium coffees include Tanzania Peaberry, Kenya AA, Arabian Mocha Mattari, Java Arabica, Sumatra Lintong, Sulawesi Toraja, Ethiopian Harrars and Yirgacheffes, and Jamaica Blue Mountain. PREMIUM GOURMET COFFEE – The terms premium coffee, gourmet coffee, premium gourmet coffee, and specialty coffee are all used to refer to the best coffee beans, carefully grown and processed in order to preserve and enhance the coffee’s unique tastes and aromas. Some of the world’s top premium gourmet coffees include Yemen Mocha, Kenya AA, , Sulawesi Toraja, Hawaii Kona, Java Arabica, Sumatra Lintong, Ethiopian Harrars and Yirgacheffes, and Jamaica Blue Mountain, and Tanzania Peaberry. PRESSURE RELIEF SYSTEM (Pressure Release System) – A three way valve system that automatically and immediately removes all pressure from the portafilter of an espresso machine as soon as the brewing of the espresso shot(s) is completed. Pressure relief systems are a feature of most commercial espresso machines and prosumer espresso machines as well as the better home espresso machines (consumer espresso machines). The pressure relief system typically uses an electronically controlled check valve that remains closed when the espresso machine is not being used. During brewing the valve opens providing a passageway between boiler of the espresso machine and the grouphead and portafilter, allowing quick, repeated espresso brewing without concern about a portafilter sneeze (the sudden and potentially dangerous release of pressure when removing the portafilter if the pressure has not been previously released). The pressure relief system is also known as a 3 way solenoid. PRICING – The process of setting coffee menu prices considering the coffee’s cost, quality, brewing formula, portion size, refill policy, restaurant type, market prices of coffee, and coffee prices at comparable restaurants. PRIMARY COFFEE FLAVOR SENSATIONS (Primary Taste Sensations; Primary Coffee Taste Sensations; Primary Flavor Sensations) – According to some coffee aficionados, the primary taste sensations in regards to coffee are soury, sharp, mellow, acidy, winey, and bland. Also see Basic Coffee Flavor Characteristics; Basic Coffee Tastes; and Secondary Coffee Flavor Sensations. PRIMARY TASTES – Sweet, sour, salty, and bitter; the basic tastes that are perceived by the human tongue when mixed with a person’s saliva. Also see Basic Coffee Flavor Characteristics; Basic Coffee Tastes; Primary Coffee Flavor Sensations; and Secondary Coffee Flavor Sensations. PRIME WASHED (Primo Lavado) – Refers to the best grade of Mexico washed coffees, which include most all the finest coffees the country has to offer. Also see Mexican Coffee. PRIMO LAVADO (Prime Washed) – Refers to the best grade of Mexico washed coffees, which include most all the finest coffees the country has to offer. Also see Mexican Coffee. PROCESSING COFFEE – See Coffee Processing. PROCESS TASTE – Refers to various taste characteristics reflecting taste defects or other off-flavors produced during processing. Examples include acrid, cereal, cooked, and caramelized. Also describes a taste defect/off-flavor as a result of technological treatment during processing. PROCTER & GAMBLE (P&G) – See Coffee Companies. 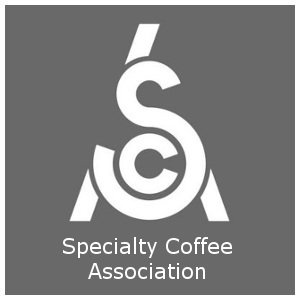 PROFESSIONAL COFFEE TASTING (Professional Coffee Judging) – See Coffee Cupping (Professional Coffee Tasting). PROFIT POTENTIAL – The potential for profit as measured in the available gross margin dollars from coffee sales (comparing cost per pound to cost per cup). PROGRESSIVE PREINFUSION – A feature of the E61 grouphead, progressive preinfusion is a process of pre-wetting the bed of roasted, ground coffee that is tamped into the filter basket and portafilter of an espresso machine. In progressive preinfusion the espresso machine’s pump activates to fill a secondary chamber before the full pressure of brewing is applied to the coffee bed. The result is three to seven seconds of saturation time for the tamped coffee before the full brewing pressure (e.g., 135 pounds per square inch) is effected to complete the brewing of the espresso shot(s). Progressive preinfusion, which many believe is the best method of extracting all of the coffee’s best flavor components, is also known as natural preinfusion. PROSUMER ESPRESSO MACHINE – See Prosumer Espresso Machines. PUCK – The bed of roasted, ground coffee in the filter basket of the portafilter of an espresso machine (espresso maker) subsequent to the brewing of an espresso. Also called Spent Puck. Also see Pack. PUERTO RICO COFFEE (Puerto Rican Coffee) – See Puerto Rico Coffee. PUERTO RICO YAUCO SELECTO (Puerto Rico Yauco) – See Puerto Rico Yauco Selecto Coffee. PULL A SHOT OF ESPRESSO (Pulling a Shot of Espresso; Pull) – Refers to the process of “pulling” a shot of espresso, or making an espresso using an espresso machine (espresso coffee maker). PULP – Fruity material just beneath the outer skin of the coffee cherry (fruit). The pulp is removed from the coffee cherry during processing. The fruity pulp has a slightly bitter taste yet does contain some sugars and also contains some caffeine. The pulp along with the skin is sometimes used to make tea. PULPED NATURAL PROCESSING – See Pulped Natural Processing. PULPER – A machine that uses rough rollers to break up and loosen the outer skin of the coffee cherry (fruit) during wet processing. Pulping often takes place immediately (e.g., within one day) after harvesting of the coffee cherry by the coffee farmers. PULPING – A stage in processing coffee cherry (fruit) involving removing the outer flesh – the red skin and mucilaginous pulp – with the purpose of separating the coffee beans from the pulp. Pulping is done with a machine called a pulper which has rough rollers that loosen and break up the cherry’s outer skin. Pulping often takes place immediately (e.g., within one day) after harvesting of the coffee cherry by the coffee farmers. Pulping is the first step after picking the coffee cherry to prepare (process) coffee using wet method processing. PULPY – A pungent coffee taste sensation which provides a fruit-like flavor, and which is created by the coffee’s pulp and skin. PULVERIZATION – The process of passing roasted whole bean coffee between two flat, rotating discs. PUMP (Espresso Machine Pump) – Espresso machines typically have either a vibratory pump or a rotary pump that creates the high pressure needed (e.g., 135 pounds per square inch) to force hot water through roasted and ground coffee to brew espresso shot(s). Vibratory pumps are most often found on home espresso machines (consumer espresso machines) and use a diaphragm which expands and contracts to create create high pressure for brewing espresso. Vibratory pumps may be provided with water from a reservoir on the espresso machine. Rotary pumps are typically found on commercial espresso machines (which are plumbed-in) and use vanes that oscillate rapidly within a sealed container to create high pressure for brewing espresso. Rotary pumps are also called Volumetric Pumps. PUMP-DRIVEN ESPRESSO MACHINES (Pump Driven Espresso Machines; Pump Machines) – See Pump-Driven Espresso Machines. PUNGENT – A strong, piercing coffee taste sensation in the mouth when the coffee is sipped. This coffee flavor characteristic is typical of many full-bodied gourmet coffees, and implies a slightly aggressive flavor. PYROLISIS – The process that occurs during the roasting of green coffee beans, during which the chemicals in the fats and carbohydrates in the beans break down into delicate oils through a series of rapid chemical reactions causing the coffee’s flavors and aromas to be released. Pyrolisis occurs when the coffee beans reach a temperature of about 465° Fahrenheit (240° Celisius), at which time the beans begin to emit their own heat, and this in turn increases the temperature of the roasting chamber.